Making good progress with your game projects? We sure hope so! This week we experiment further and listen to what you guys need for your game making exploits by bundling in facesets of the monsters contained in the release! Once again we continue with the task we started last week and unveil RTP Alter II ! a series of resources aimed at covering alternative designs to monsters found in RPG Maker MV’s RTP in line with the style the Librarium uses ! Oculus, Buff and speedy, not to mention his reflexes are top notch! Shadin, a spectral flame who loves playing tricks on unsuspecting visitors. Baron Valz, part of the eldritch nobility! Can you feel his piercing look? Duke Merem, an aristocrat of utter finesse and refinement. This month we will continue to try new things so stay tuned! Also keep an eye out in the Librarium’s website, as this week we finally (and gradually) begin rolling out its second version featuring new sections, more intuitive navigation and the like! As a final note, we’d like to thank our twitter friends and everyone who came over to last weekend’s picarto stream, Thank you! -Yanfly, Rukaroa, Archeia Nina & Aldo ! Also, will you be adding face-sets for your previous battlers? BTW: Beef is gonna be a hard boss. The Axe Cake is beautiful! Enjoy Beef! And his Axe! Those are great ideas! Look forward to our poll system soon! I love your Minotaur battler, but something strange is happening whenever I use it. When I have it in battle, it’s being covered by a giant black square. Is there something I’m doing wrong? Are you still getting this issue? Could you please take a screenshot and share it here? I’m a bit late to the party here, sorry, but I too am having the same issue, with both Beef and Demios. For me, though, I think it’s the fact that I’m (attempting) to run MV on an older computer, and because the image size is relatively large it’s crapping out and displaying a large black box where the sprite should be. I did get it to work, but it required me to alter the size of the file, which goes against your T.o.U, not to mention the dip in quality was very noticeable, so it’s absolutely not the solution… (and sorry for breaking the rules). Hey sorry for the late reply and sorry to hear! Yeah I’ve been told about the issue with the huge frames in older animated battlers and I’ve totally taken it into consideration for future releases! 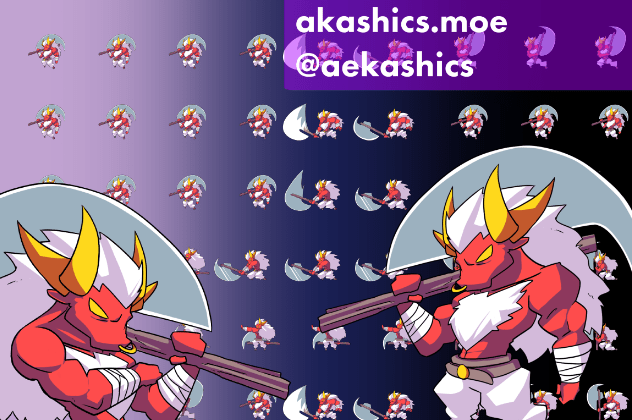 I’m definitely going to rework the old ones as well, but I don’t have an estimated time of delivery yet, thanks for the support and the kind words, stay tuned for more updates including one tomorrow with three new animated battlers! Hey, Ækashics, just a quick question from a very slow-working fan of your work, do you have any plans on making an animated version of Rigel the Werewolf? I was considering making a character that can transform into a werewolf in battle, and it would look odd for an animated person to change into a nearly inanimate beast of terror. I could settle for using Beef to change things up a bit if not, but figured it’s better to ask in the first place than not. First of all thank you for using the Librarium battlers! Rigel is part of the RTP Alter, and right now my main focus for animated Sideview battlers is also RTP creatures, so yes! A werewolf (Possibly riggel) will see light in aniamted SV format at some point! Haha of course it is! Sorry for the late reply! Look forward to more! These battles are incredible, please keep up the great work! I have run into an issue. When I attack the battlers in game, the animation is not centered and sometimes doesn’t hit the battler at all. Does anyone else have this problem or know how to fix it? I think it has to do with the size and dead space of the image based on what I see I’m gimp. Yes this is an issue with older animated battlers because I still had not learned the proper frame size back then, I plan to revisit them and fix them at some point, right now only Alstreim has received this fix, stay tuned!